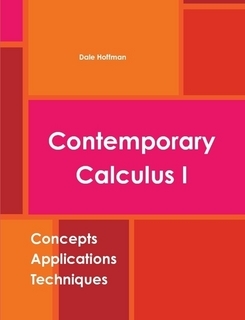 This is a textbook for differential calculus with explanations, examples, worked solutions, problem sets and answers. It has been reviewed by calculus instructors and class-tested by them and the author. Topics are typically introduced by way of applications, and the text contains the usual theorems and techniques of a first course in calculus. Besides technique practice and applications of the techniques, the examples and problem sets are also designed to help students develop a visual and conceptual understanding of the main ideas of differential calculus. Openness Comments: Word version is available via email from the author.